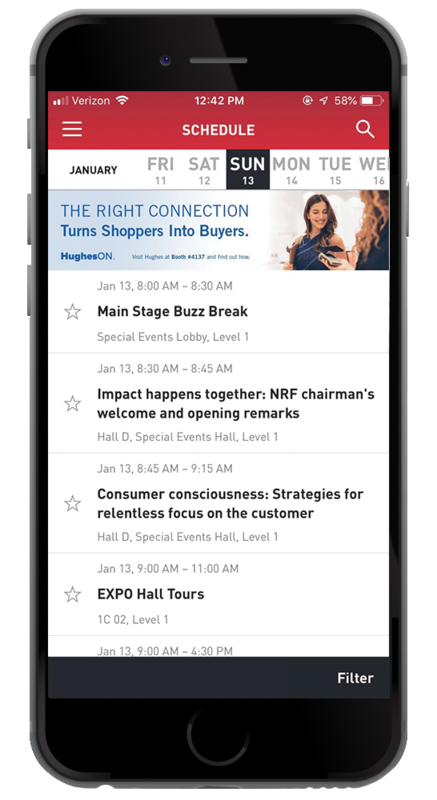 The NRF Event App gives you access to everything you need to know about NRF 2019. Check out some exciting features below. By favoriting sessions in the agenda, you can create a custom schedule that best fits your time at the show! Use the “Find Me” feature in the 3D map to find booths in the EXPO hall. Enable bluetooth for the best experience! Scan & Go kiosks and avoid long lines. Network with attendees - Connect with retailers and solution providers by using the messaging feature within the app. The NRF Foundation has helped thousands of people take their first steps towards promising retail careers. For each unique session rating in the mobile app, the NRF Foundation will receive $1 to benefit its scholarship programs. Download the NRF Event App from your mobile device's app store by searching "NRF-National Retail Federation."